What does the inside of your freezer look like? Mine looks pretty sparse but includes a hidden gem of a dinner... which took me some time to figure out. My freezer included frozen spinach, sun-dried tomatoes (the dried variety with no oil) and boneless skinless chicken breasts. When faced with random ingredients to work with, I figured any filling I can make would do well stuffed into a chicken breast. I've always been a fan of spinach and sun-dried tomatoes together, especially with goat cheese. So for tonight's dinner, I made a filling with these ingredients which I stuffed into the chicken breasts. To add a bit of texture, after filling the chicken, I coated it with seasoned panko breadcrumbs and baked until cooked. Accompanying this chicken was some leftover mushroom marsala risotto. This stuffed chicken turned out really well and my husband requested I make it again! Pound each chicken breast half thin, about 1/4 inch thickness, using a meat mallet, set aside. In a bowl, combine the goat cheese, tomatoes, and spinach to create the filling. Season with sal and pepper to taste. Place 1/4 of this mixture on one end of each pounded chicken breast. Roll into a large tube, making sure to keep the filling inside the chicken. Set up your dredging station but placing the flour in one shallow dish, whisk the egg in another shallow dish and the breadcrumbs and dried oregano in another shallow dish. Carefully dredge each stuffed chicken breast in flour to coat. Next, dip the stuffed chicken breast into the whisked egg. Lastly, roll the stuffed chicken breast in the breadcrumbs. Place each coated stuffed chicken breast on a baking sheet and once all are coated, bake in the preheated oven for 15-20 minutes. Oh wow - this looks delicious! Great "freezer-find"! Very savory. Chicken is my favorite. 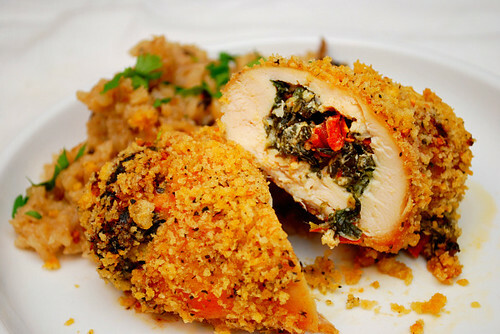 Stuffed chicken recipes have been catching my eye a lot lately - yours sounds wonderful! I love anything with sun dried tomato. This is a good combination with the goat cheese, sun dried tomato and spinach. This might be a silly question, but I just don't understand one thing: how do you dip chicken into a scrambled egg? thanks! this recipe looks amazing and my boyfriend actually requested it!